Want to know what sort of changes are in store for Reston? Come to our community meeting, where RCA, RA and ARCH will tell you how the new Comp Plan will affect us - and how it could be better. Lately, I’ve had plenty of opportunities to think about how much better it is to do things together than to go it alone. As I mentioned last week, I recently got married. From my perspective, married life has a lot to recommend it. It’s great on a practical level – you have someone to split the chores with – but also on an emotional level. Having someone to help celebrate your triumphs and lighten your burdens, a trusted confidante and companion, and someone to start and end each day with… it’s all a blessing. It’s great to have someone else on your team. RCA has been working very hard on the Task Force, but it has been a long and lonely struggle at times. As you know if you have followed our comments, we believe the draft Comprehensive Plan less than ideal for Restonians in a lot of ways. But we’re only one voice on the Task Force; there’s only so much we can accomplish on our own. Happily, we’ve discovered that we aren’t alone. In conversations with leaders from RA and ARCH, we’ve found that we have a lot of views in common. And we agreed that our voices would be amplified if we spoke up together. So we decided to stand up together on behalf of the citizens of Reston. Like a good marriage, our collaboration allows us to benefit from each organization’s strength. We at RCA bring our analytical skills and deep involvement throughout the process to the table. RA brings its formidable resources to the table. For instance, they’ve been able to hire a land use attorney as an advisor (something we could never afford), and they have a much larger megaphone to communicate with our citizens. ARCH contributes its community connections and experience in complex community issues. When we unite those strengths, it’s a very powerful combination. Our collaboration is starting to pay off. We’ve agreed on a joint statement expressing our guiding principles for the Phase I Comprehensive Plan. We’re working on a joint comment for the Task Force expressing our common views on how the plan can be improved. 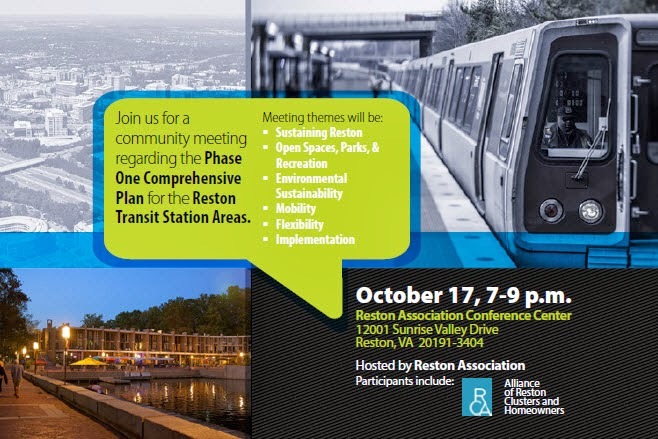 And we’re holding a community forum to let Restonians know what’s in the plan, how it will affect Reston’s future, and our ideas for making it better. The forum will be on Thursday, October 17th from 7 to 9 PM at RA headquarters. Task Force chair Patty Nicoson will be there to talk about the work that’s been done so far. Heidi Merkel of the County’s Department of Planning and Zoning will talk about the plan from a County Perspective. And then representatives from RA, RCA, and ARCH will share our thoughts about the plan and how it will affect Reston’s future. We’re having this meeting because we want to make sure our citizens know what’s in store for our community. But we also want to hear from you, and find out what matters most to you, so that we can better represent the community’s interests and concerns. So we won’t just be there to speak to you; we’ll also make sure you have the opportunity to make your voice heard. This is a really crucial meeting to attend if you’re a Restonian and you care about our community’s future. The new Comprehensive Plan, and the new development that will be built around the Silver Line, will change the face of Reston for decades to come. It will impact our traffic, our vitality, our environmental quality, our parks and recreation facilities, and our future direction. If you’ve been following the process closely, now is the time to speak out and make yourself heard. If you haven’t been following it, now is the time to get informed and involved. I’m really glad that our three organizations are coming together on behalf of our citizens. We’re much more powerful and effective when we speak as a united voice. And it’s particularly important for us to join forces on the Task Force. The developer representatives, while they don’t agree on everything, have shown themselves as a fairly united force throughout the process. They know how the game is played, they know what they want, and they know how to get it. The citizen representatives need to have the same unity of purpose and resolve. Together, we can push for a plan that builds on Bob Simon’s vision and creates a community that’s ready for the future while maintaining the values and amenities that we all love about the Reston of today. I hope to see you at the meeting next week. And I look forward to working with RA, ARCH, and other civic organizations to ensure that Reston’s future lives up to its past. Just like my marriage, I hope that our organizational partnership lasts a long time, and that we’re able to enjoy a lot of success together.